It's "V - The Ultimate Variety Show,? with something for everyone! Why See V - The Ultimate Variety Show? With so many shows to choose from on the Strip, you will find that ?V? gives the most bang for your buck - rolling the cream of the crop into one great show, guaranteeing two thumbs up from the audience. Every show includes magic, special effects, death-defying stunts, wild comedy, visual artists, physical insanity and much more! Unique specialty performers from around the world come together in this fast-paced showcase of record breaking, jaw dropping, uproarious, turn-of-the-tables where the specialty acts rule the show! With unique talents and exciting new forms of entertainment frequently evolving the line up, V will captivate audiences again and again. It's variety, it's Vegas, it's ?V - The Ultimate Variety Show,? with something for everyone! Suitable for all ages, but only those aged three and up are allowed into the V Theater. 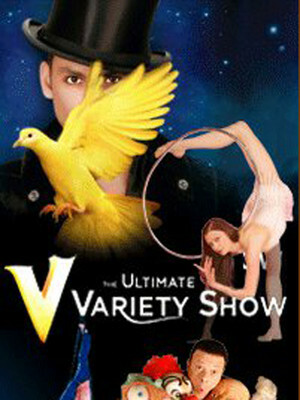 Seen V - The Ultimate Variety Show? Loved it? Hated it? Sound good to you? Share this page on social media and let your friends know about V - The Ultimate Variety Show at V Theater. Please note: The term V Theater and/or V - The Ultimate Variety Show as well as all associated graphics, logos, and/or other trademarks, tradenames or copyrights are the property of the V Theater and/or V - The Ultimate Variety Show and are used herein for factual descriptive purposes only. We are in no way associated with or authorized by the V Theater and/or V - The Ultimate Variety Show and neither that entity nor any of its affiliates have licensed or endorsed us to sell tickets, goods and or services in conjunction with their events.